We promise to keep updating it if you promise to keep visiting! 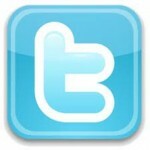 Please “Like” us on facebook and follow us on twitter. We are very grateful to the First Unitarian Universalist Society of New Haven for their ongoing support of our work. 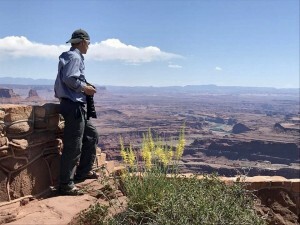 Bioregional Group member Steve King (pictured below in Utah) has compiled a Comprehensive Guide to Reducing, Reusing, and Recycling in the New Haven area. We are very grateful to Steve for developing this tremendous resource. 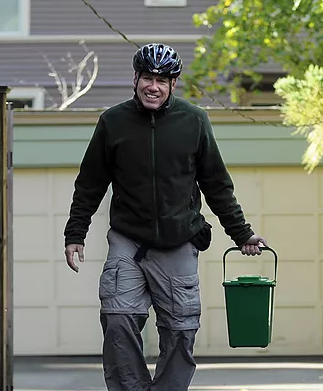 Read this NY Times story about why recycling is positive and beneficial but only one part of a comprehensive strategy to reduce waste and protect the environment! 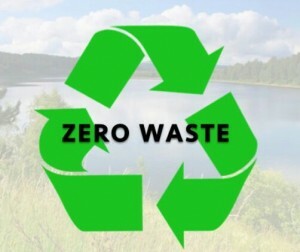 Remember to practice all three R’s: REDUCE, REUSE, AND RECYCLE! 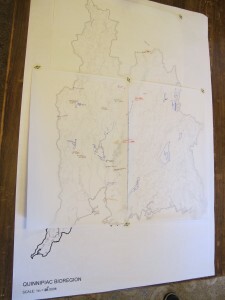 An exciting project to connect different parts of the Mill River watershed with a pedestrian linkage got a major boost recently when the State of Connecticut approved a $289,000 grant for developing two sections of the proposed Trail. The Bioregional Group has supported the Mill River Trail concept since sponsoring this 2008 walk following the river from the Whitney Museum down to New Haven Harbor. Read more about recent developments here and here. Specifically how do these definitions relate to the New Haven / Quinnipiac Bioregion? Two 24×36″ black-and-white maps were laid out on the table — one of the streets and waterways of the City of New Haven, and the other of the watersheds and topography of the New Haven-Quinnipiac Bioregion. With these maps serving as the base layers, we overlaid them with tracing paper and began to add layers of our own experience. Bike commutes were drawn in favorite colored pens. Combined Sewage Overflow sites were plotted. 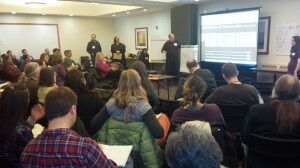 Favorite hiking spots, locations of community meeting places, parks, gardens, beaches. Other maps were referenced, and questions filled the room. We were left with ideas for places to visit, things we want to learn more about, and how others might add their own layers to these maps. We continued to consider how we might create maps that tell stories about our experience with our place. We look forward to seeing where this takes us, and we invite you to join in the exploration. Domingo Medina, longtime Bioregional Group member and composter par excellence, has been selected as a finalist for the Connecticut Department of Energy and Environmental Protection’s “Green Circle” Award. The Awards ceremony will take place on May 23 in Hartford. Read more. “Earth Loyalty and Bioregional Practice: The Collected Writings of Fred Cervin” is now available for purchase online at Amazon and Barnes & Noble. Proceeds from book sales go to support the work of the Bioregional Group. Bioregional Group members Lynne Bonnett and Domingo Medina have been working this summer on a citizen science project with community partners including: Yale Peabody Museum’s Afterschool Evolutions Program, the Mercury Research Lab at John Jay College in New York City, and the New Haven Environmental Justice Network. 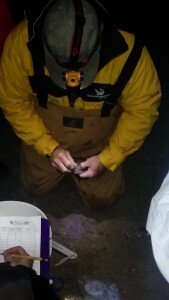 Our moss samples to measure airborne mercury went up on July 1 and came down July 21. Now they are undergoing analysis at the lab in New York City. 1) To determine if there is a geospatial distribution of airborne mercury around the largest point source in New Haven: Greater New Haven Water Pollution Control Authority’s sewage sludge incinerator just next to East Shore Park. 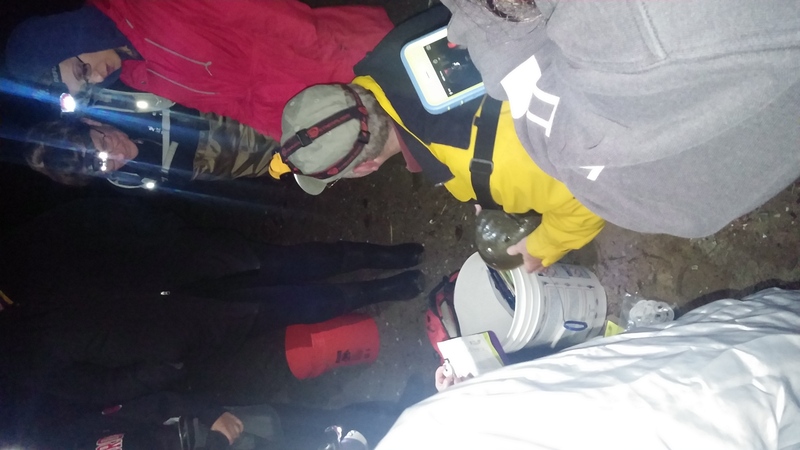 Samples were taken at different distances from the incinerator along transects. We expect to observe a distance effect of mercury levels associated with the source of emission. 2) To test if this type of study can be done in urban settings such as New Haven. Given the different potential sources of mercury emissions in an urban environment, we want to see if our instrument with our methodology is sensitive enough to capture airborne mercury and if it can discern a clear spatial pattern of mercury deposition. Our citizen scientists have been hard at work: constructing poles from PVC pipe, washing sphagnum moss, weighing and putting the moss in hairnets, tying them to poles, digging the hole and putting the pole in the ground!. Next up, trip to NYC for a tour of John Jay College and a visit to the mercury lab where the samples are being analyzed. Project Limulus — More Citizen Science In Our Bioregion! 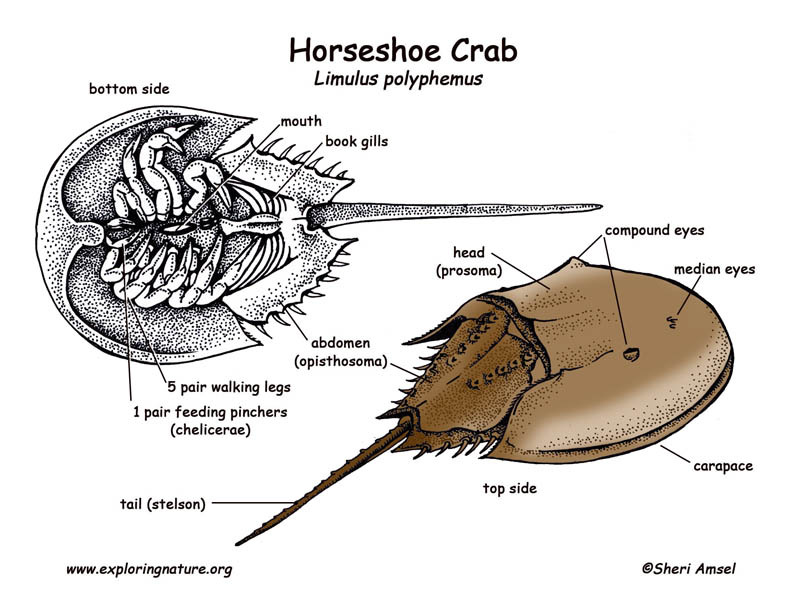 Begun in the 1990s, Project Limulus is a partnership by researchers at Sacred Heart University, the US Fish and Wildlife Service, and citizen scientists, to monitor the population ecology of the eastern horseshoe crab, Limulus Polyphemus, a remarkable species of Marine Arthropod that has been around for 400 million years. In the late spring, Limulus Polyphemus visits various locations along the Connecticut shoreline to mate. 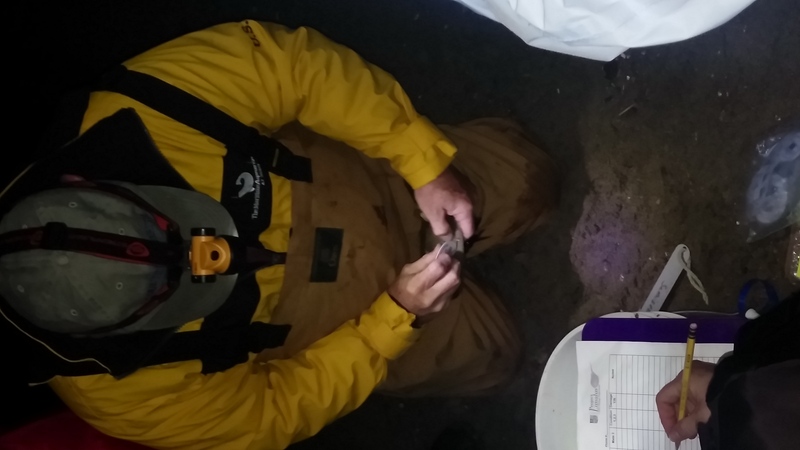 When volunteers find a crab specimen, they carry out scientific measurements and then give the crab a tag to help monitor population and habitat changes over time. Bioregional Group member Aaron Goode has been a volunteer tagger for the last two years. 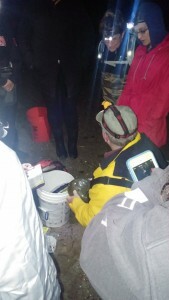 These photos were taken at a tagging expedition last night (June 2, 2015) at Calf Pasture Beach in Norwalk. We’ll be talking more about (and hopefully seeing specimens of!) this amazing species on our CT Trails Day walk this Sunday at Sandy Point. Join us! 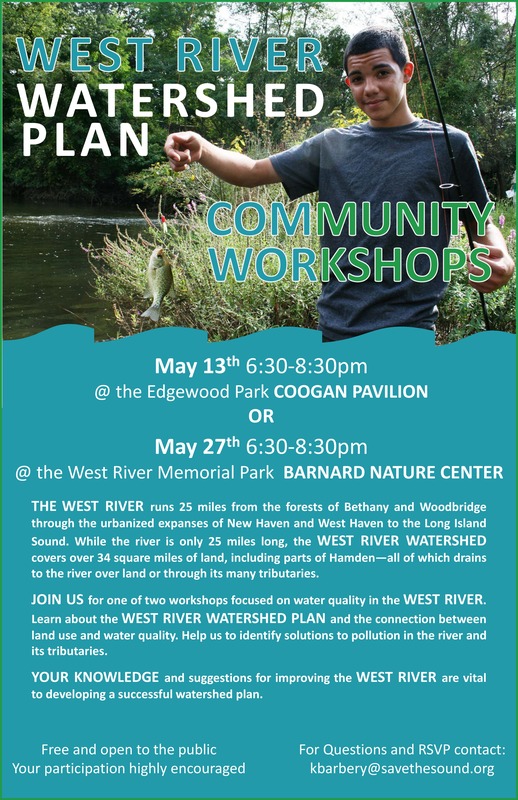 West River Watershed Management Plan — Your Help Needed! 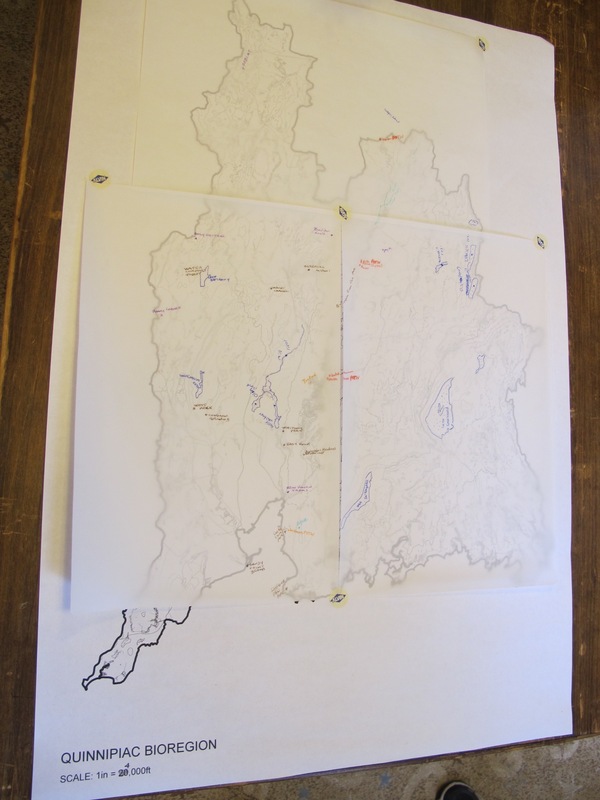 The West River Watershed Coalition is developing a watershed management plan for the West River that will outline long-term strategies for improving water quality, restoring habitat, and enhancing recreational access. 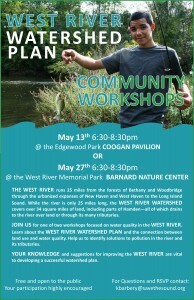 The second public input-gathering session will be held on May 27 at the Barnard Nature Center. A few months ago Bioregional Group members Lynne Bonnett and Domingo Medina were invited by the Yale Peabody Museum’s EVOLUTIONS Program — an afterschool program for high school students from New Haven and West Haven — to talk about ways to understand and connect with our bioregion. 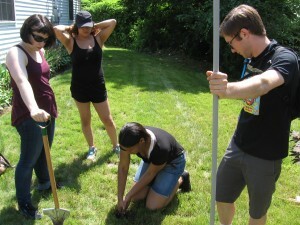 The relationship between EVOLUTIONS and the Bioregional Group has grown into a summer research project to measure mercury levels in New Haven’s airshed to get a better understanding of what mercury air emissions are like in an urban environment. Lynne and Domingo are excited to work with the students along with the Mercury Research Lab at John Jay College and the Yale Peabody Museum of Natural History. It will be a unique opportunity for the students to learn about research projects on an applied environmental justice issue in New Haven and participate in all aspects of the monitoring and data collection process. 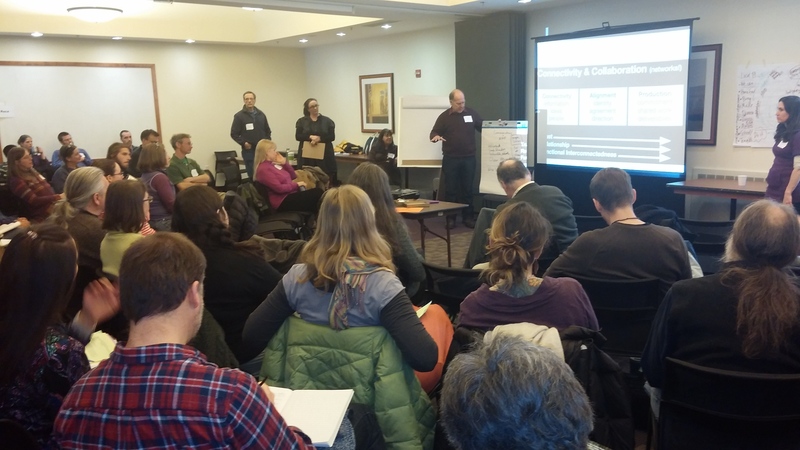 Recently we attended a gathering of the New England Resilience and Transition Network (or NERTNET) in Keene, New Hampshire. The Bioregional Group was a founding member of NERTNET several years ago because we believe that local resilience-building and regional cooperation go hand in hand. Would you or your organization be interested in joining the Network and contributing to its work of fostering regional resilience? Fill out this brief survey. Here is perhaps the most delicious turn that comes out of thinking about politics from the standpoint of place: anyone of any race, language, religion, or origin is welcome, as long as they live well on the land. The great Central Valley region does not prefer English over Spanish or Japanese or Hmong. If it had any preferences at all, it might best like the languages it has heard for thousands of years, such as Maidu or Miwok, simply because it is used to them. Mythically speaking, it will welcome whomever chooses to observe the etiquette, express the gratitude, grasp the tools, and learn the songs that it takes to live there. In treading upon the insubstantial ground of the future we take certain risks, and we must face the fact that the word “utopian” has become an epithet, a chastisement, for those who would dream of things that never were and imagine that they still might be. Yet it is a necessary part of any political construct that it offer an image of the future that can be regarded as positive and liberatory and realistic and energizing. This, I submit, bioregionalism succeeds in doing. ― Kirkpatrick Sale, "Mother of All: Introduction to Bioregionalism"
Unless we personify Earth, we will not be able to repent, will not change enough, or soon enough. The writing is on the wall, stark and terrible. Implacable forces are already in play. The future of our species on this planet is at stake. It’s not just at risk. Don’t say it’s at risk. Disaster is a certainty if we don’t change radically. We are on a runaway train heading toward an abyss. All this is happening because we have forgotten our Mother the Earth. We have no regard for her. We make our most consequential economic decisions without a thought for Earth. We treat her like an inert mass of raw materials or like a sterile desert of no use except as a place to throw our garbage. What we have lost fundamentally is a fresh, lively sense of our own dependence. We think of our relations with Earth as environmentalism— as if Earth were a mere externality, something in need of minimal maintenance—rather than being bone of our bone and flesh of our flesh. “Mother Nature” is a tired, worn-out figure of speech, useful only for sentimental greeting cards. The reality is quite different. She is the Goddess, and She will be honored, whether in heartfelt love and respect, or in catastrophe. Those who despise her will pay the price. I say there is now only one way left, one hope for our species: to love Earth. To feel in our hearts that we are a part of Her, what we do to Her we do to ourselves. If you love Earth, you will not fail to evaluate any possible action in light of its effects on the one you love. If you love Earth, then you will vow earth loyalty. This is the one way change can come in time: hundreds of millions vow Earth Loyalty. There is no other way.